Judging by how the market has been trading this first week of December you might have the idea that everything in the world is great and getting even better. Ireland seems to have been saved, remember Greece, it too must be fixed. There can't be any issues with Portugal, Spain, or Italy can there? I wanted to share a quick picture of what Euribor trading thinks of the rally and the job of saving the world that the IMF, ECB, and of course the FED did last week. 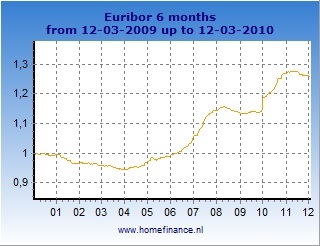 First, let's look at 6 month Euribor. We seem to have come off just a hair from stress levels. I'll continue to watch the "recovery"
Next, here is a view of 3 month Euribor. I am not overlooking the impact that year-end funding decisions have here. While we are already in December it becomes increasingly tough for firms and banks to borrow over the holiday period. As a moneymarket trader in my first years on the desk, this was the scariest time to be in a position to be without funding for the firm. Most companies that needed funding and didn't already have it sewn up in the last weeks of the year were going to get punished as buyers of their risk would hold out for higher rates. I don't think that the spike and recovery here is due to year end funding, but I'm sure there is some move up (slight) simply due to the time of year. 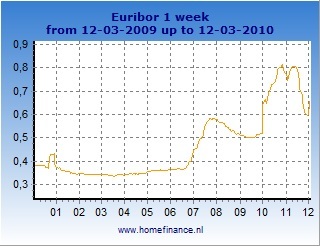 Finally, we have a snapshot of 1 week Euribor. Everything looks pretty good here, but take a look at what happened over the last 2 days of the snapshot. That doesn't indicate to me that everyone is comfortable that a resolution in Europe is complete. Last as I check in on sovereign debt CDS at Markit we see that Friday's trading in CDS demonstrated that things were getting better. For 5 Yr CDS protection we see the following (which were all improvements).